Astronomers using the Hubble Space Telescope have conducted the first spectroscopic survey of Earth-sized planets in the TRAPPIST-1 system's habitable zone. This video is public domain and can be downloaded from NASA's Scientific Visualization Studio. In 2016, Hubble observations also did not find evidence for hydrogen atmospheres in c and d. These results and the new ones, instead, favor more compact atmospheres like those of Earth, Venus and Mars. Additional observations are needed to determine the hydrogen content of planet g's atmosphere. 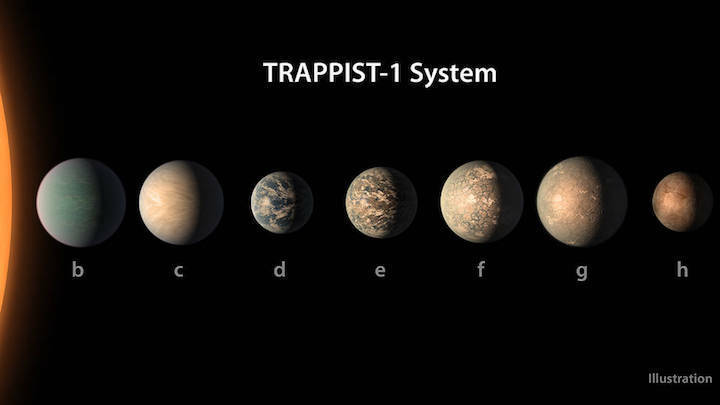 t’s still too early to pack your bags for TRAPPIST-1. But two new studies probe the likely compositions of the seven Earth-sized worlds orbiting the cool, dim star, and some are looking better and better as places to live (SN: 3/18/17, p. 6). New mass measurements suggest that the septet probably have rocky surfaces and possibly thin atmospheres, researchers report February 5 in Astronomy & Astrophysics. For at least three of the planets, those atmospheres don’t appear to be too hot for life, many of these same researchers conclude February 5 in Nature Astronomy. One clue to potential habitability is a planet’s mass — something not precisely nailed down in previous measurements of the TRAPPIST-1 worlds. Mass helps determine a planet’s density, which in turn provides clues to its makeup. High density could indicate that a planet doesn’t have an atmosphere. Low density could indicate that a planet is shrouded in a puffy, hydrogen-rich atmosphere that would cause a runaway greenhouse effect. Using a new computer technique that accounts for the planets’ gravitational tugs on each other, astronomer Simon Grimm of the University of Bern in Switzerland and his colleagues calculated the seven planets’ masses with five to eight times better precision than before. Those measurements suggest that the innermost planet probably has a thick, viscous atmosphere like Venus, Grimm says. The other six, which may be covered in ice or oceans, may have more life-friendly atmospheres. The fourth planet from the star has the same density as Earth and receives the same amount of radiation from its star as Earth, Grimm’s team reports in Astronomy & Astrophysics. Having an atmosphere could suggest habitability, but not if it’s too hot. So using the Hubble Space Telescope, MIT astronomer Julien de Wit and his colleagues, including some members from Grimm’s team, observed the four middle planets as they passed in front of the star. The team was looking for a signature in near-infrared wavelengths of light filtering through planets’ atmospheres. That would have indicated that the atmospheres were full of heat-trapping hydrogen. In four different observations, Hubble saw no sign of hydrogen-rich atmospheres around three of the worlds, de Wit and colleagues report in Nature Astronomy. “We ruled out one of the scenarios in which it would have been uninhabitable,” de Wit says. Finishing the puzzle may have to wait for the James Webb Space Telescope, scheduled to launch in 2019, which will be powerful enough to figure out all the components of the planets’ atmospheres — if they exist.